Branding isn’t just about a pretty logo, it’s about your bottom line! “Branding” is one of those buzzwords that gets tossed around a lot these days. It would be easy to assume that this is only a subject that multinational corporations should be concerned with. But if you assumed that, you’d be missing a major opportunity. Branding applies to every business, large and small, local and international. It can make or break you and frankly you can’t live without it. No matter what your business is, chances are very good that you’ve got competitors nearby offering the same or a very similar product. Whether you are an architect or interior designer, a mechanic or law firm, there will be others in your town. If you sell groceries, a fine dining experience, real estate, auto mechanic services or business consulting, you’re not alone. Branding is what distinguishes you from others offering similar products and services. The purpose of branding is to set a product or service apart in the minds of customers, so they remember it, develop loyalty and know what to expect from it. Think of brands you know, especially ones you like. Starbucks, Ford, Toyota, Aveda, Apple, Home Depot, Nike – these are all well-known brands. You probably have an association in your mind with each one, favorable or unfavorable. Like them or not, they have successfully differentiated themselves from other brands in the marketplace. The person who buys Tide detergent is more interested in getting clothes clean than someone who prefers a no-name brand to save money. The Starbucks crowd wants a premium product in an aesthetic setting as opposed to Dunkin Donuts customers who don’t care about the experience and just want donuts and coffee. A woman who only uses Aveda products has reasons she considers important, even though she pays more for them than the woman who buys Suave products at the drugstore. Well-known, international corporations have invested hundreds of millions of dollars in building and maintaining an image for their brand. Sometimes even large companies make incredible mistakes that damage the brand. It can take years to restore their strong brand in the minds of the consumer, if they ever recover at all. So you’re not Nike, Apple or Starbucks. That’s fine. No matter what industry you’re in, the more you can develop a strong identity which sets you apart from your competitors, the better. Branding can be a challenge for business owners. Even a successful business may not realize which principles have made it so successful. Consider a successful auto repair shop. Let’s say that what made it successful was personal attention and caring customer service – the mechanics would always take the time to patiently educate customers until they really understood it. This would be a big part of that company’s brand. If this garage then tried to advertise “faster repairs than anyone else,” it would completely miss the core essence of their brand. Big mistake. Suppose a college town has a coffee shop that only hires students. The clientele is 97% students from the university across the street. Then the shop is sold and the new owner staffs it with his family. They downgrade to a slower Wi-Fi because it’s cheaper. The students who used to come to study and greet the employees (who could sympathize with them on upcoming finals) rapidly find somewhere else to sip coffee. Why? The new owner neglected to grasp the core elements at the heart of the earlier owner’s success. He didn’t understand the brand. Every company needs to understand the core values at the heart of their success. This might take a little soul-searching or deep conversations with loyal customers to truly discover it for yourself. However, it’s totally worth it. You’re spending money on marketing all the time—every business is. The trick is making sure you’re making the most of it. Are you getting the best possible return? Correct branding can save you tens of thousands of dollars in marketing because your message isn’t watered down. You’re conveying exactly the right message to exactly the right people. Does your message truly resonate with your audience? Does it really convey the essence of who you are as a company? Does it really “speak” to potential prospects and draw them toward you? Don’t just use your “best guess” here. Ask past customers. Ask people unfamiliar with your company as well. Get different viewpoints on your brand and strengthen it with what you find. Branding isn’t just about a pretty logo. It’s about your bottom line. 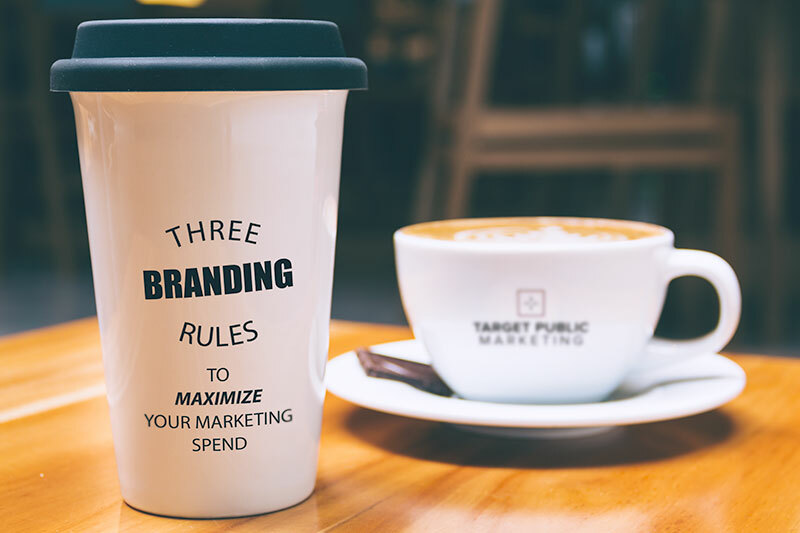 At Target Public Marketing, we understand the ins and outs of branding and have helped countless other businesses like yours get their message straight. We can do expert analyses to help you isolate the exact core of your company’s brand and help you correctly convey it to others. It’s a relatively fast service that we deliver routinely. And for what you receive—a clear company identity that can be used to guide all future promotion—it’s a bargain. Reach out. We’re here to help, whether through casual conversation or an in-depth service.